You’re used to flipping pages in a physical book, but the Kindle Fire HD and other e-readers provide you with several ways to move around. Home: Located in the bottom-left corner, this button takes you to the Kindle Fire HD Home screen. Back: Tap the button of a left-pointing arrow to go back one screen (not page). Search: Use the magnifying glass button found in the middle of the screen to initiate a search for text in the book. Favorites: Tap this button to see a list of Favorites, which includes items from just about any category of content or apps that you want to access quickly. 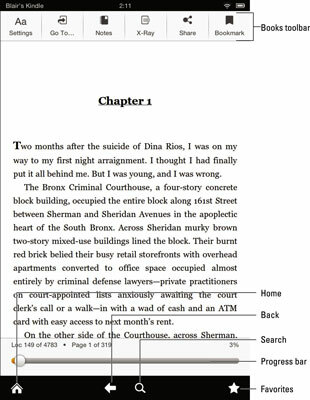 Settings: Tap this button to make adjustments to the fonts and font size, page color, and margins, or to enable Text-to-Speech to have Kindle Fire HD read the book to you. Go To: Use this button to access additional locations including going to a specific page or location; syncing to the furthest read page; or viewing the beginning, cover, or front matter, or any chapter in the book. Notes: Displays any notes you have made in the book. X–Ray: Tap this button to view additional information about the book if it’s available for that title. Share: Use this button to share your thoughts about the book via Twitter or Facebook. Bookmark: Places a bookmark on the page. The Progress bar along the bottom of the screen indicates how far along in the publication you are at the moment. To move around the publication, you can press the circle on this bar and drag it in either direction.